Growing summer flowers in balcony boxes, hanging baskets, garden vases. Erica and other plants of the heath family as a planting soil used in the autumn. The soil is suitable for plants that need to grow in a moderately acidic soil (pH 4,6-5,5). INGREDIENTS: Peat, compost, sand, clay. Peat – the main component, is neutralized with dolomite meal and mixed with fertilizers. “House plants soil”, produced by Matogard OÜ, contains the plant nutrient-rich compost resulting from the biotechnological treatment of horse manure that ensures a suitable microbial mix for plants. Sand – adds porosity to the soil allowing for good drainage so water will not stand, thus blocking air. Clay – binds water and prevents the soil from drying out. The plants can be replanted at any time; however the optimum time to do this is in the spring. Depending on the plants growth rate, the new pot should be slightly larger than the old one. When using clay pots, soak them in water beforehand. Place fragments of crockery or ceramsite to enable drainage after watering. Put a thin layer of new soil over this drainage material and then match the plant with the old soil ball at an appropriate height in the pot. Fill the space between the soil ball and the pot with new soil. Leave 1-2 cm free space below the rim. After planting, the plant needs to be watered thoroughly and protected from direct sunlight. In order to avoid drying, it is advisable to cover the soil surface with a layer of ceramsite. 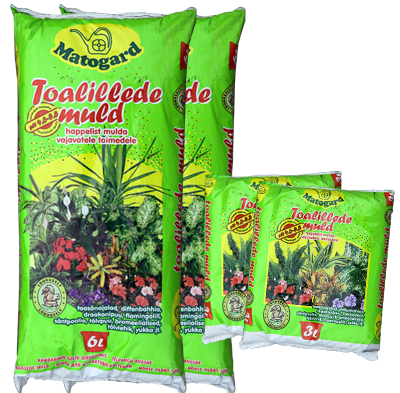 The compost used by Matogard OÜ in the preparation of the soil for indoor plants binds nutrients and does not let them get washed out of the soil as a result of irrigation. Boston fern, dumb cane, azalea, dragon tree, tree ivy, African violet, cabbage plant, yucca, peace lily etc.